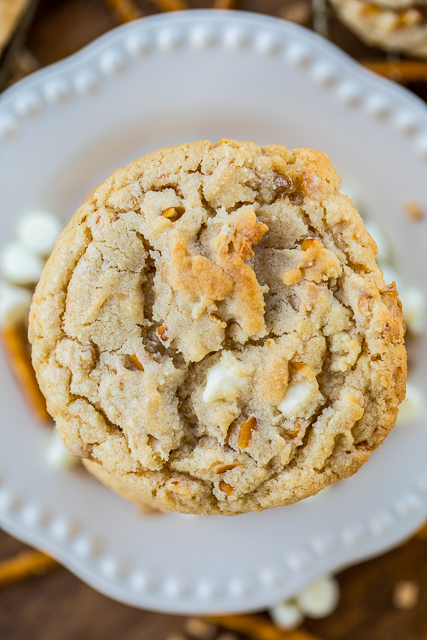 White Trash Cookies - cookies loaded with white chocolate chips, toffee bits and pretzels. A few months ago, I got some cookies from a local bakery. They were delicious. I bought chocolate chip, salted caramel and a white trash cookie. The White Trash Cookie was our favorite. 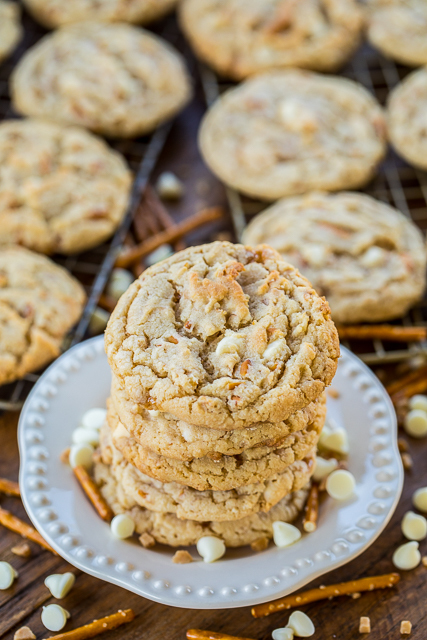 It was loaded with white chocolate chips, pretzels and toffee bits. I knew I had to recreate it at home. OMG! 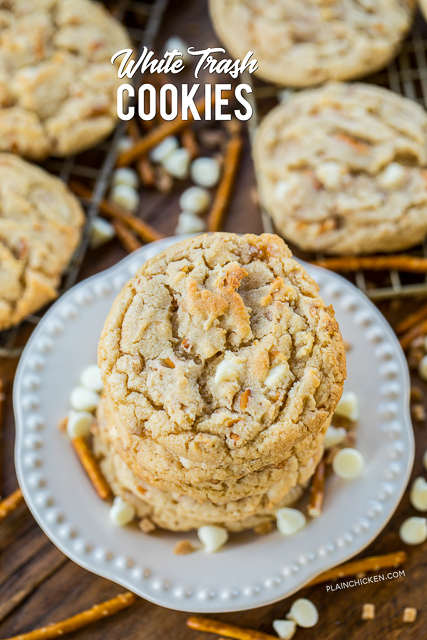 You must make these cookies! They are seriously delicious! Neither of us could stop eating them! I probably ate about six cookies the first day. I made giant White Trash Cookies. I used my largest cookie scoop and got about 16 giant cookies. If you want to make regular sized cookies, you will get about two dozen cookies. Chicken Legs likes big cookies, so I made big cookies! You can make the White Trash Cookie dough and freeze the dough in balls for quick cookies later. Just add a few minutes to the baking time if you are baking the dough frozen. 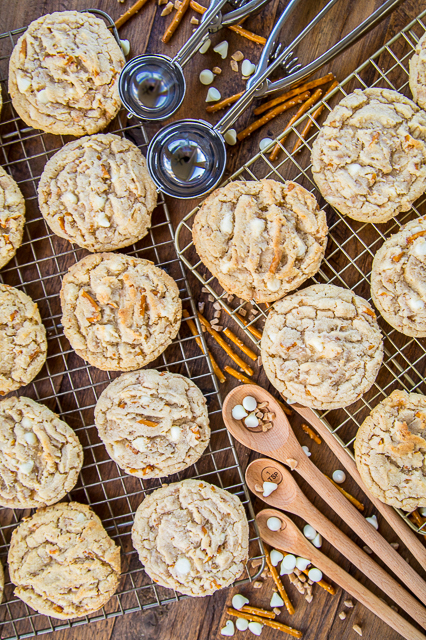 You can freeze the baked cookies too, but we all know fresh baked cookies taste best! Preheat oven to 375ºF. Line baking pans with parchment paper. In the bowl of an electric mixer, beat together brown sugar, white sugar and butter until fluffy. Mix in egg. Add Bisquick and vanilla. 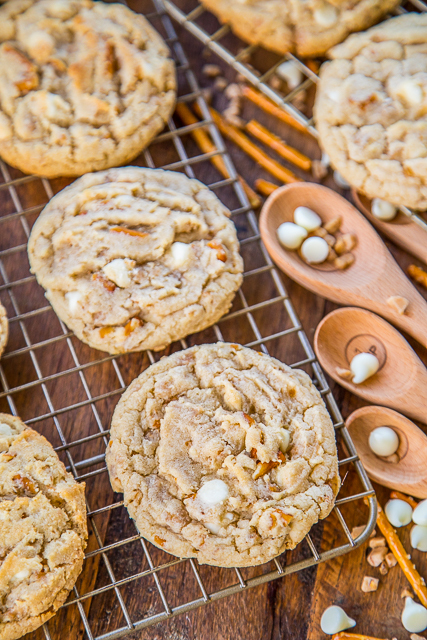 Stir in white chocolate chips, toffee bits and pretzels. 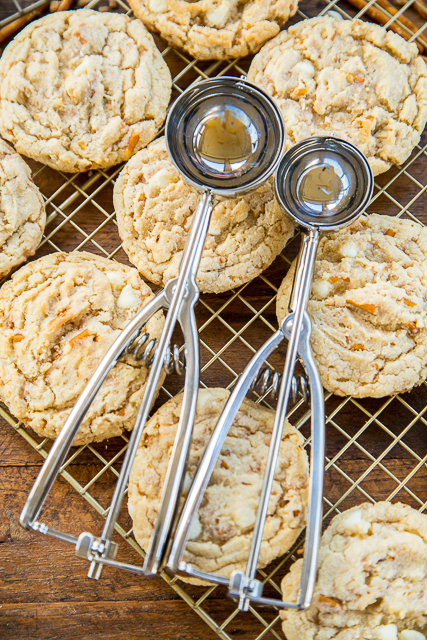 Using a large cookie scoop, scoop dough onto baking sheets. Bake 10 to 12 minutes. Cool on wire rack. could these be made a little smaller? I made these and they are sooo good. Will surely make again. Hubby is a cookie lover, and they were gone by next morning. Sure! You’ll have to play with the baking time. Maybe start with 25 minutes and check them every 5 minutes or so. I just made these cookies, however I used Jiffy baking mix. I'm wondering it that may be why they seem a little too salty? I will try again with unsalted butter and more white chocolate chips. There is no added salt in the cookies, so I'm not sure. Maybe the Jiffy baking mix is salty?